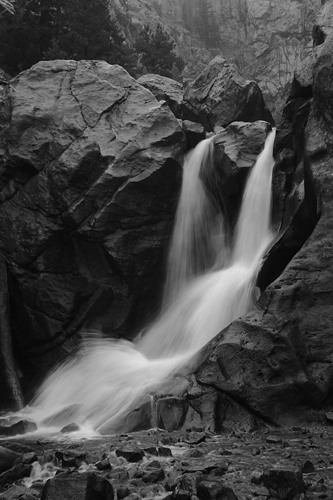 The image above was created at Boulder Falls, outside Boulder, CO during a light rain. The overcast weather created muted light to enable a tripod-assisted long exposure. The light rain accented the gray granite rocks through which the water cascaded. After catastrophic flooding in and around the Boulder, CO area recently, the re-building efforts are taking place. The rising water destroyed homes, roads and communities in areas that serve as gateways to the beautiful Rocky Mountains. Anyone wishing to help can do so at: http://rdcrss.org/1993W8e .